The rich maritime history and diversity of life found in the Chesapeake Bay come alive in this unusual museum in Solomons. Here you'll find boats, models, paintings, wood carvings, aquariums and fossils. Outdoor exhibits include a boat basin, River Otter habitat, and a recreated salt marsh and the Drum Point Lighthouse. 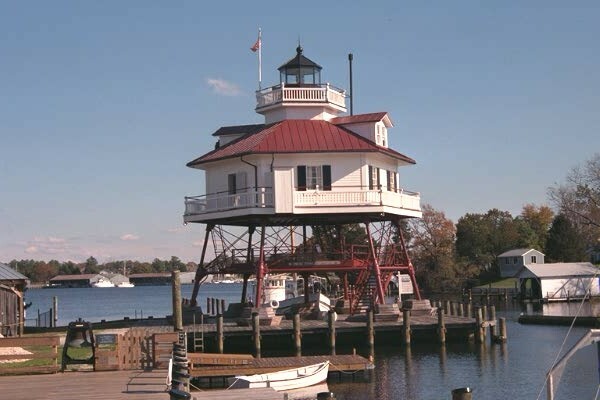 Enjoy a leisurely one-hour cruise around Solomons Harbor and the Patuxent River aboard the "Wm. B. Tennison", the oldest Coast Guard licensed passenger carrying vessel on the Chesapeake. Built in 1899, this nine-log chunk built bugeye was later converted from sail to power and served as an oyster buyboat until 1978. Please call or visit our website for seasonal schedules of exhibits and tours. The museum also owns the nearby J.C. Lore Oyster House and the operational Cove Point Lighthouse. The oyster house is within a half mile of the museum. It offers a first-hand view of the tools used by local watermen to harvest fish, clams, eels, crabs and oysters. The Cove Point Lighthouse is located at Cove Point on the Chesapeake Bay, just north of Solomons Island in Calvert County. It is currently a functioning navigation aid and it is maintained by the U.S. Coast Guard. However, it is owned by the Calvert Marine Museum. Tours and access to the lighthouse are only available through the Museum.